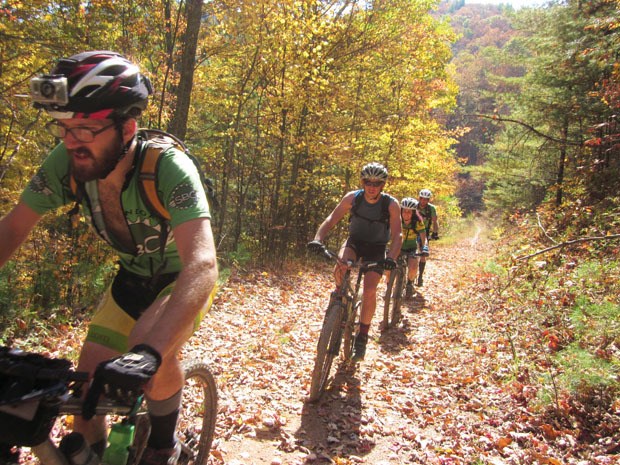 The 500-mile Virginia Mountain Bike Trail is poised to be the South’s sweetest stretch of singletrack. Virginia’s diagonal ridge of mountains boast a quarter of the Appalachian Trail and half of the Blue Ridge Parkway. 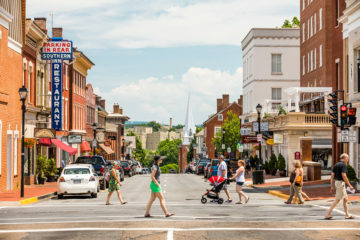 Now, a new project is taking shape in the Virginia highlands that could eventually rival the A.T. and the Parkway. A decade ago, Chris Scott saw the growing interest in long distance mountain bike trails like the Colorado Trail, Arizona Trail, and Continental Divide Trail in the West and got an idea. 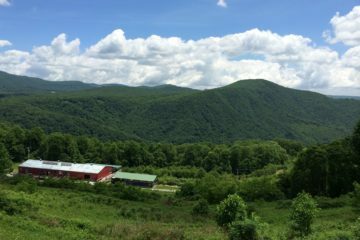 Scott and his partners were already leading multi-day cross country biking tours in George Washington National Forest and directing the Shenandoah Mountain 100 through their company, Shenandoah Mountain Tours, so they decided to take it to the next level. 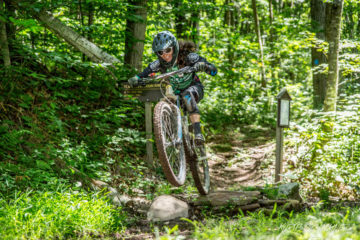 So began the ambitious project to create the Virginia Mountain Bike Trail (VBMT), a continuous 480-mile trail traversing the state from north to south. This region of the Blue Ridge is already well established as a premier mountain biking destination, but Scott was looking for something more. 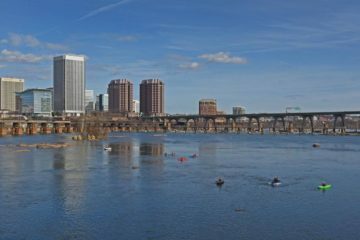 “We just knew that Virginia had so much amazing stuff to offer. 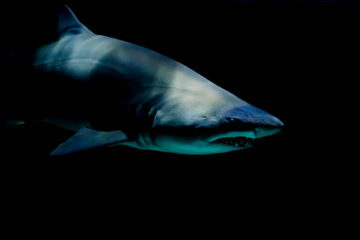 We wanted to create our own epic dream,” he said. Edwards got involved in the initial stages of the VMBT long before joining IMBA. He is just one of the many locals involved in the conceptual realization of the long distance route. 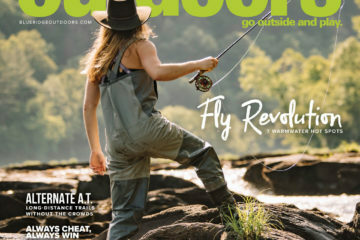 “Virginia always seemed like it would be the epicenter for where a long distance mountain bike trail on the East Coast could start, largely because we have such a long extended section of public lands that has really good opportunities for piecing together a mountain bike route using existing trails, existing dirt roads and low use paved roads,” he said. Currently, the IMBA does not have any direct involvement with the route, but over the years, they have provided non-funded support for the VMBT by assisting in networking and planning. The core of the actual trail work is being done by volunteers from various biking communities and clubs. Like the A.T., the VMBT was created by linking a patchwork of eight existing trails systems, mostly on public land in the George Washington and Jefferson National Forests to complete the route. 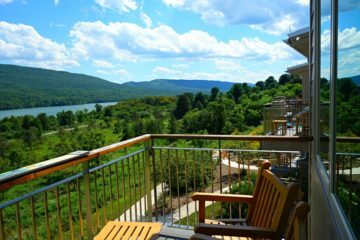 These include well-known trails like the Shenandoah Mountain Trail, Mill Mountain Trail, and the Iron Mountain Trail near Damascus. The trick was linking them all together into one continuous ribbon of singletrack. 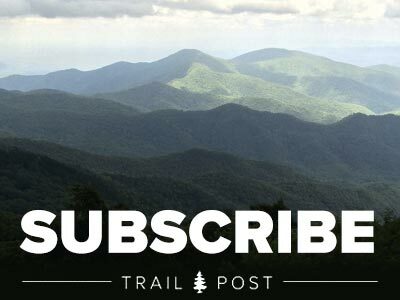 The Virginia Mountain Bike Trail from Summit Publishing on Vimeo. After an initial multi-day trip on the northern portion of the trail in 2010 with pro rider Jeremiah Bishop and pro coach Tim Johnston, the fall of 2011 marked the first attempt at riding the entire length of the trail. The group rode it over a period of four days, climbing a combined 65,000 feet in the process. While the trip was deemed a success, the VMBT has a long way to go and faces many challenges ahead, the first being the nature of the trail itself. It passes through some of the most rugged and challenging in the state, especially on a mountain bike. When dealing with almost 500 miles of trail, keeping the trail clean and navigable is a tough task, especially given the remoteness of some of the sections. Scott says the biggest challenge is trail maintenance. 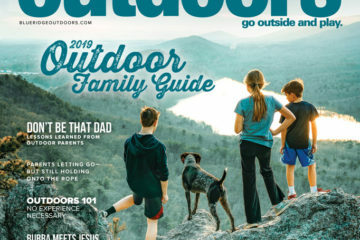 Scott has enlisted the help of volunteers from organizations like the Shenandoah Valley Bicycle Coalition, Mid Atlantic Off Road Enthusiasts, and more to assist in the bulk of trail maintenance and preservation. Local mountain biking clubs are also instrumental in raising awareness of the project, which in turn helps gain more support. The U.S. Forest Service has the final say on trail decisions because almost the entire trail cuts through their lands, but they appear to be on board with the project. Budget cuts have made it near impossible for the Forest Service to continue upholding all the trail under their jurisdiction. They now rely heavily on volunteers to assist in the basic trail maintenance of the trails along the VMBT route. This seems to be a win-win for both parties. The final vision of the trail includes a hut-to-hut system, much like shelters on the A.T., but until then, camping is basically the only option. A growing interest in the sport of bike-packing has led to amazing innovations in ultra light bike racks and frame bags, but a trip of this magnitude will tax even the fittest rider. 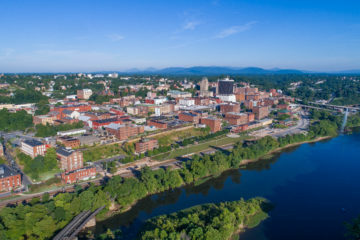 Scott envisions connecting the Virginia Mountain Bike Trail with neighbors north and south, and says he and his contacts up and down the East Coast have the intention and ambition to pull it off. “If we create this amazing Virginia trail, we could take it north to Maryland and Pennsylvania and south into North Carolina and Tennessee, and all the way down into Georgia,” he said. The VMBT is not recognized by the U.S. Forest Service as an official trail—not yet, at least. It will take many more hours of trail work and infrastructure to accomplish that goal, but as counter-intuitive as it sounds, the extreme distance envisioned in the final product may actually help the process along, according to Edwards. But is there a market for a mountain bike trail that rivals the A.T. in length, and would people actually ride it? 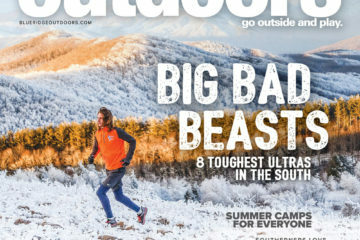 The growth of ultra-endurance versions of all outdoor recreation, from cycling to trail running to kayaking and multi-sport adventure racing certainly suggests so. 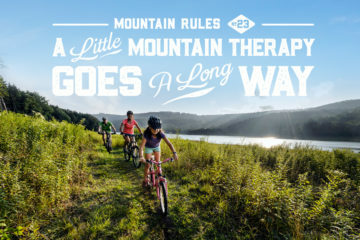 It is not too hard to imagine riders young and old packing up their bikes for rite of passage on the Great Eastern Mountain Bike Trail just as hikers have been doing on the A.T. for decades. Just as hikers section hike the A.T., Scott and Edwards can see bikers using this trail in a variety of capacities. Section riding is one option, as is creating a system of spoke trails connecting hubs of trail systems so one could spend a couple days exploring a contained system of trails before moving down the spoke to the next hub. The applications seem to be endless, but there is still a lot of work to do to get there. Scott will be taking his second annual thru-ride next month, and success will only encourage the route’s expansion. Virginia Mountain Bike Trail from Scott Wootten on Vimeo. The GDMBR follows the Continental Divide as closely as possible from Banff, Alberta, Canada to Antelope Wells, New Mexico. This is a distance of about 2,745 miles, although the route is in constant flux and not well posted. Ninety percent of the route is on unpaved roads and trails with over 200,000 feet of elevation change along the way, making weather and supply access the biggest hurdles in any attempted thru-ride—that and bear attacks. Two races take place every year to test the mettle of riders: the Tour Divide Race follows the entire route, while the Great Divide Race follows only that portion in the U.S. The Continental Divide Trail traces the continental divide through the Rockies from Canada to Mexico. The National Scenic Trail passes through Idaho, Montana, Wyoming, Colorado, and New Mexico, rising as high as 14,000 feet and falling no lower than 3,900 feet. Along with the Appalachian Trail and the Pacific Crest Trail, it forms one third of the Triple Crown of long distance hiking in the US. The Colorado Trail runs east to west across the state from Denver to Durango, covering 486 miles, about half of which is shared with the Continental Divide Trail. Mountain bikers are permitted on most of the trail, although not on the portions that travel through wilderness areas. The trail rises above tree line in several spots and runs through six mountain ranges. Completed in 2011, the Arizona National Scenic trail runs north from the Mexico border through Arizona to its northern border with Utah. The trail passes through a wide variety of landscapes and ecosystems on its 800-mile route, from the deserts of the south to the San Francisco Peaks of the North. The Arizona Trail also passes the Grand Canyon, making it one of the most diverse trails in the U.S.